As the nation honors civil rights icon Dr. Martin Luther King Jr. Monday, a host of Democrats believed to be eyeing a presidential bid in 2020 will be delivering high-profile speeches across the country on what is shaping up to be a precursor to a long and crowded campaign to unseat President Donald Trump. At least six major contenders for the Democratic nomination are slated to give speeches or are attending events honoring King, a major opportunity for them to speak to an issue that promises to be front and center during the 2020 campaign: race. Amid speculation that they both might seek the Democratic nomination for president in 2020, former Vice President Joe Biden and former New York City Mayor Michael Bloomberg offered tributes honoring King at a breakfast in Washington, D.C., hosted by civil rights leader Rev. Al Sharpton. Michael Bloomberg speaks at the annual Martin Luther King, Jr. Day Breakfast hosted by Rev. Al Sharpton and National Action Network in Washington D.C., Jan. 21, 2019. Biden, who has said he will announce his 2020 plans sometime in the near future, started his remarks joking he "had an announcement to make." He quickly transitioned, however, to the need to carry MLK’s legacy forward and continue to fight the "dark forces" that assassinated King and are still visible in society, referencing the racial unrest in Charlottesville in 2017. "That was [King’s] last ... among his last words spoken, ‘to make America what it ought to be.' America's been made better by all the struggles many of you in this room have endured and led," Biden said. "But we've learned the last two years it doesn't take much to awaken hate, bring those folks out from under the rocks -- part of American society that's always been there will always be there." Former VP Joe Biden at MLK breakfast: "America's been made better, all the struggles many of you have endured and led. Biden discussed the racism that exists in the U.S, and the need to stay vigilant against voting rights restrictions and the need for criminal justice reform, acknowledging he hasn’t always gotten it right on the latter. "You know I've been in this fight for a long time. It goes not just to voting rights, it goes with the criminal justice system," he said. "I haven't always been right. I know we haven't always gotten things right, but I've always tried." Biden said he is optimistic about the future of the country and the millennial generation, who he believes will lead the way. He also reflected on the historic inauguration of President Barack Obama, the nation's first black president, in which he played a central role 10 years ago this weekend. "There I was, it just hit me, standing, waiting for a black man to come 28 miles from Philadelphia to pick me up and take me on a 128-mile mile ride to be sworn in as president and vice president of the United States," he said. "Don't tell me things can't change!" 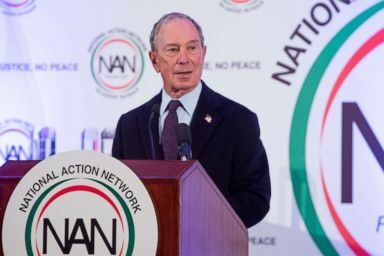 Bloomberg, who last year registered as a Democrat and has not shot down questions about whether he will seek the White House in 2020, said whatever happens in the next year, both he and Biden are focused on defeating Trump. "Whatever the next year brings for Joe and me ... I know we'll both keep our eyes on the real prize, and that is electing a Democrat to the White House in 2020, and getting our country back on track," Bloomberg said. The former New York City mayor, who was a registered Independent for 11 years and a Republican prior to that, also joked that he wanted to ask Biden for tips on what life is like in the nation's capital. "I haven't had a chance yet to talk to the vice president at length today but I did want to get some pointers from him on how it's like to live in Washington, D.C.," Bloomberg said to muted laughs. "I actually thought that was funnier than you did." The flurry of campaign activity also comes as California Sen. Kamala Harris made her presidential bid official in an interview on ABC's "Good Morning America" with anchors Robin Roberts and George Stephanopoulos. "I love my country. I love my country," Harris said. "This is a moment in time that I feel a sense of responsibility to stand up and fight for the best of who we are." Harris also said she was "proud" to announce her campaign on the same day the nation honors Dr. King. "The thing about Dr. King that always inspires me is that he was aspirational. He was aspirational like our country is aspirational," Harris said, "We know that we've not yet reached those ideals. But our strength is that we fight to reach those ideals," Harris said. "So today, the day we celebrate Dr. King, is a very special day for all of us as Americans and I'm honored to be able to make my announcement on the day we commemorate him." President Trump also marked the holiday with a brief visit to the site memorializing Dr. King along the Tidal Basin in Washington, D.C., later tweeting a video saying it was an "honor" to pay tribute to King. Sen. Bernie Sanders (I-VT) and Sen. Cory Booker (D-NJ) both spoke at the NAACP "King Day at the Dome" event in Columbia, South Carolina, giving harsh rebukes of Trump as they honored Dr. King. "Today we talk about justice, today we talk about racism. And I must tell you, it gives me no pleasure to tell you that we now have a president of the United States who is a racist," Sanders said on the steps of the South Carolina statehouse in Columbia. "We are gathered together because we believe in our democracy, and we know in this country the power of the people is always greater than the people in power," said Booker, who referenced a "spiritual dissatisfaction" with the current state of American society in his speech. "We're dissatisfied that we live in a society that's getting seduced by celebrity and forget that significance is more important than celebrity, that purpose is more important than popularity, that we cannot be a nation that loves power more than it loves people," Booker added. Sanders, who was Hillary Clinton's top rival for the Democratic presidential nomination in 2016, won just 26 percent of the vote in South Carolina in the 2016 Democratic primary, a harbinger of his later struggles with black voters, who propelled Clinton to victory in every single southern state. 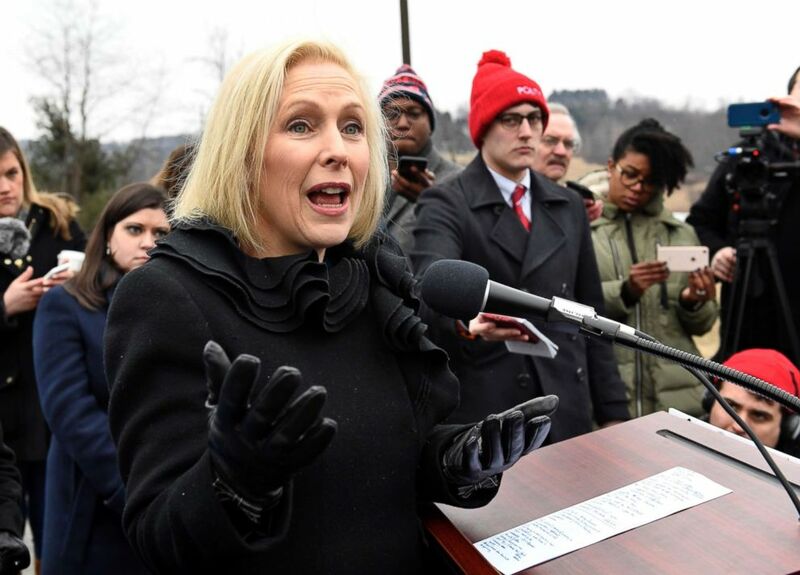 Sen. Kirsten Gillibrand, (D-NY) who last week announced the formation of a presidential exploratory committee and is fresh off her first campaign swing in Iowa, joined at a National Action Network event in Harlem. Sen. Kirsten Gillibrand speaks with reporters during a news conference, Jan. 16, 2019, in Brunswick, N.Y.
She struck an aspirational tone while decrying what she says are Trump's attempts to "tear this country apart." "Every generation has chosen to make a more perfect union, to bring more people into those rights. For a reason –- because that’s who we are as Americans. Despite all our flaws. We want to bring people together, not tear them apart," Gillibrand said at an event alongside Sharpton and other elected officials in New York City. She also acknowledged that the burden of fighting discrimination and racism cannot be pushed on communities of color alone. "Fighting against this will take all of us -- it cannot be a fight left to people of color alone. It is wrong to ask men and women of color to bear the burdens of every single one of these fights over and over and over again," Gillibrand said. "White women like me must share in this burden and commit to using our voices to amplify yours." Sen. Elizabeth Warren (D-Mass. 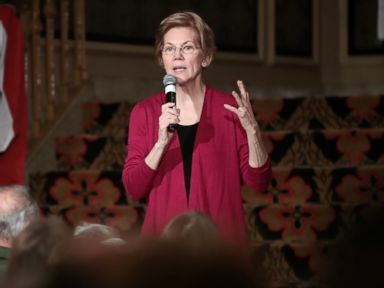 ), who has also announced a presidential exploratory committee and has made campaign trips to Iowa and New Hampshire in recent weeks, spoke at a breakfast in Boston honoring King Monday morning. 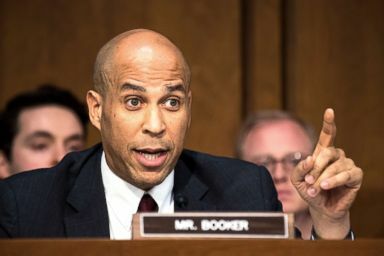 Sen. Cory Booker questions William P. Barr, nominee to he Attorney General of the U.S., during his confirmation hearing in the Senate Judiciary Committee, Jan. 15, 2019. Many Democrats are hoping that the types of conversations about race in speeches on Monday will extend beyond the holiday and that candidates will have honest conversations about issues facing communities of color all across America. Both Warren and Gillibrand sought to highlight the economic plight of those communities in sleekly produced videos announcing their exploratory committees. "It is outrageous to ask women of color to bear the burdens of every single one of these fights over and over again," Gillibrand said in a clip featured in her announcement video. "Working families today face a lot tougher path than my family did," Warren said in her announcement video. "And families of color face a path that is steeper and rockier, and a path made even harder by generations of discrimination." Sen. Elizabeth Warren (D-MA) speaks to guests during an organizing event at the Orpheum Theater, Jan. 5, 2019, in Sioux City, Iowa. Former San Antonio mayor and secretary of Housing and Urban Development Julián Castro made an explicit reference to the Black Lives Matter movement during his presidential announcement earlier this month. "If police in Charleston can arrest Dylann Roof after he murdered nine people worshipping at Bible study without hurting him, then don’t tell me that Michael Brown, and Tamir Rice, and Aiyana Jones, and Eric Garner, and Jason Pero, and Stephon Clark, and Sandra Bland shouldn’t still be alive today, too," Castro said during his announcement speech in San Antonio, referring to African-Americans who were killed in encounters with police. "We’re going to keep saying their names and those of too many others just like them who were victims of state violence. We’re going to keep saying that Black Lives Matter while working toward a justice system where it’s true." The Democratic field in 2020, which could be as large as 20 candidates, including potentially eight U.S. senators, is shaping up to be one of the most diverse in history. Of the seven major candidates who have formally announced presidential bids or exploratory committees, one, Harris, is African-American, Castro, is Latino and another, Hawaii Rep. Tulsi Gabbard, is Asian; additionally, four five of the candidates are women. Other candidates of color who have been rumored to have 2020 aspirations include Booker, former Attorney General Eric Holder and Los Angeles Mayor Eric Garcetti, among others. ABC News' Molly Nagle contributed to this story.